Review – Marrying Emily By Susan Stoker – 5 Stars!!! Join the Delta Force team as they help Emily and Fletcher celebrate their wedding day. What surprises could possibly lay ahead? Susan Stoker has written a sweet romantic novella for Emily and Fletcher with one hell of a punch that you won’t see coming. Their story starts out like most wedding days, full of love, family, friends and a life time of happiness ahead. Your heart melts as you watch two people shout to the world just how much they love each other. 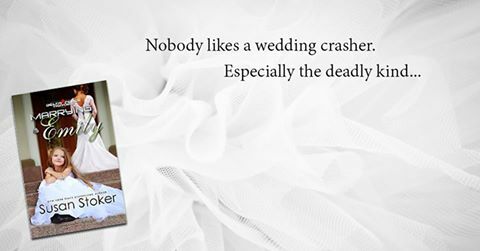 Suddenly in an ingenious way Susan Stoker throws in a curve ball that could more than ruin their wedding day. There are so many things I love about this novella, however it’s hard for me to go into detail without giving away the most amazing parts of this story. Annie is as smart, sweet and beautiful as ever. We get to see how intelligent and clever she is and how much she has touched the hearts of those around her. Emily and Fletcher prove to us once again just how perfect they are for each other and how they have brightened up and fulfilled each other’s lives since they met. It was beautiful to see how supportive their friends and family are of them and how they too support them, and its magical to see how in tune they all are with each other. When the time struck none of them hesitated to do what it took to protect the people they and the men around them loved. This isn’t your typical wedding romance; this story holds so much more than that. It teaches us to live for the moment and that if we work together we can come out on top. Although this book can be read as a standalone; to fully enjoy this story I would recommend at least reading Rescuing Emily book #2 in the series.